Reply, titled 'For Miss Chisholm'. Short, probably incomplete copy, or notes made after patient visited Cullen in person (no incoming letter traced). Summary Reply, titled 'For Miss Chisholm'. 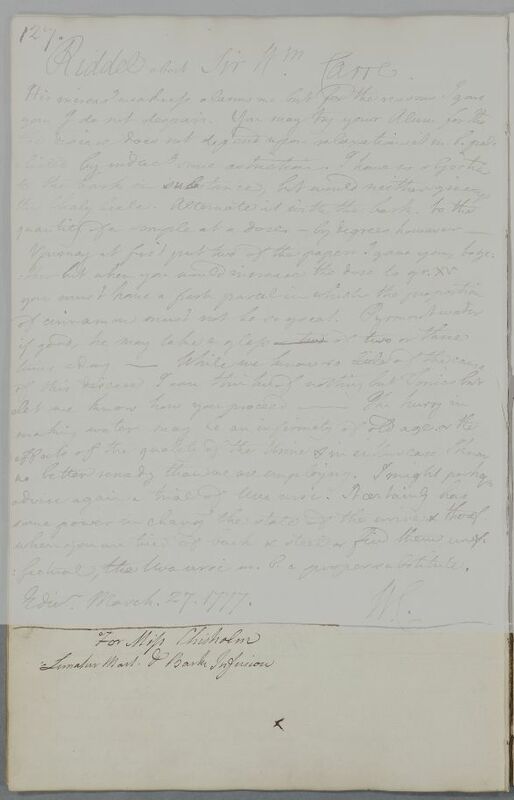 Short, probably incomplete copy, or notes made after patient visited Cullen in person (no incoming letter traced). Case of Miss Chisholm, who is prescribed iron and a Peruvian bark infusion. 1: One of several very short entries in the casebooks. An incomplete copy, or possibly notes made after the patient visited Cullen in person (no incoming letter traced).